Holi is one of the famous festivals of India and it is known to be a festival of colors and happiness. Indians celebrate Holi every year during the end of Feb to Mid of March as a symbol of good over evil, inspired by mythological stories. In 2019, Holi celebration will start from Wednesday 20 March and end on Thursday 21 March. But there are different styles of Holi celebration in different regions of India where this festival last for more than a week. 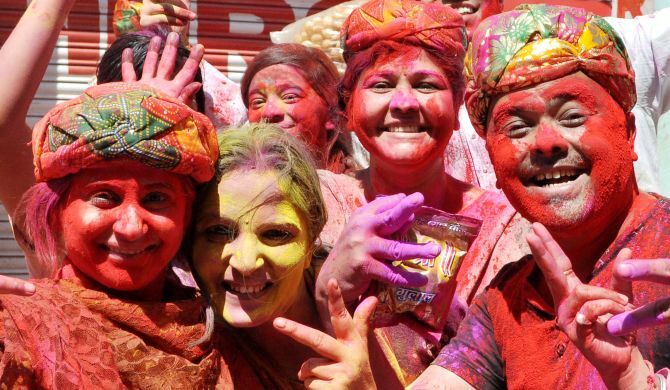 Every year a number of foreigners come to celebrate Holi in India. 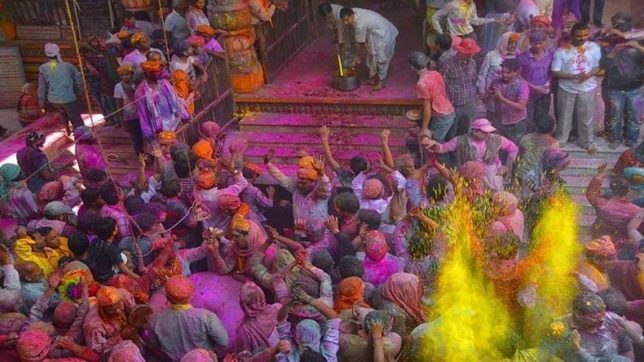 In this article, we are mentioning 12 Most popular types of Holi celebrations in India foreigners should attain in 2019. People celebrate this festival by the bonfire and applying colors (Gulaal) on each other’s face to express their love and togetherness. It’s a two days celebration, full of entertainment and numerous other activities like dancing, singing, consuming different beverages and sweets. Primarily Holi is being played by inspiring a mythological story. According to the history of Holi and the story, Lord Vishnu saved his devotee Prahlad from her evil father Hiranyakashyap and aunt Holika. Another story is based on the divine love of Radha and Lord Krishna. 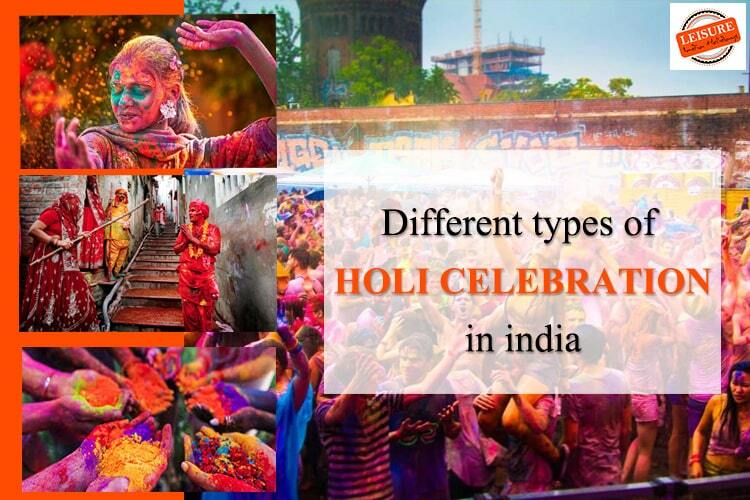 India is a land of disparity; it is exciting to know about how do people celebrate Holi differently across the country. Some famous types of Holi in India are Lathmar Holi, Dol Jatra, Phaguwa, Rang Panchmi/Shigmo, Yaosang, Baithaki/Khadi, Manjal Kuli/Ukuli, Basant Utsav and Dola. If you are thinking to celebrate Holi in 2019 in India then definitely it is a brilliant idea as it will be a lifetime experience to cherish. It’s obvious to get confused by so many types of Holi celebrations in India. So, If, you are specula which one to choose from the list, then let us help you decide. Below are some quick bites on a different style of Holi celebration in India to ease out. Lathmar Holi Festival is one of the unique and famous ways of Holi celebration in Uttar Pradesh province in India. Lathmar Holi of Barsana is primarily celebrated in the native place of Lord Krishna. All the natives of the area of Vrindavan, Mathura, Nandgoan, and Barsana come together to celebrate Holi with Lathis (Sticks) and colors made up of Kesudo and Palash flowers. 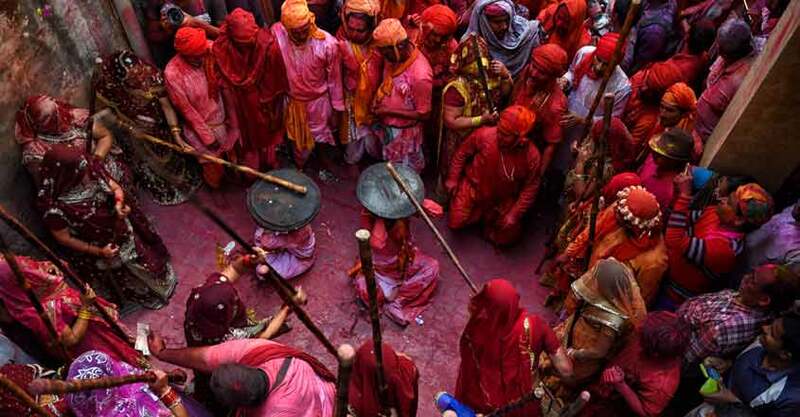 As per tradition, Gops (men) of Barsana try to invade in Nandgaon to play Holi with Gopis (women). In reciprocation, Gopis beat the Gops (men) with the sticks to pervert themselves to get colored. Isn’t that fun to watch and take part in it!! 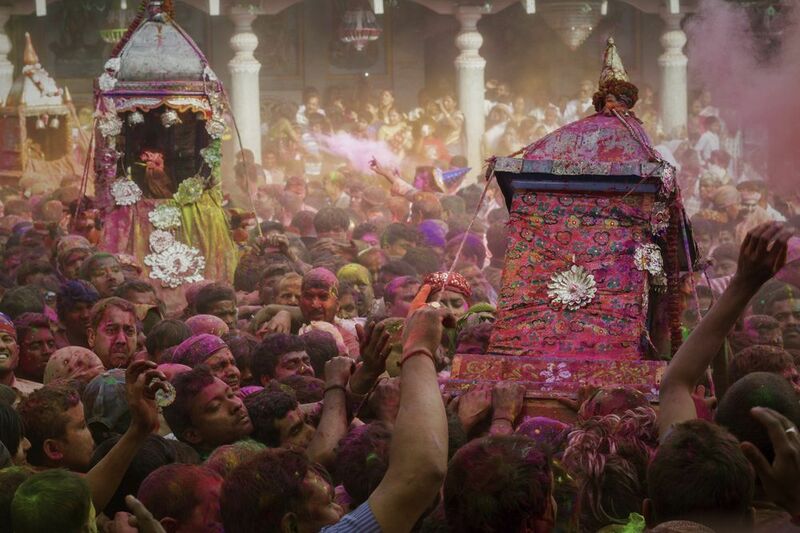 People from all over the world come for Lathmar Holi in Mathura every year. Shouldn’t Lathmar Holi 2019 be in the checklist!! Dola Holi is celebrated among the coastal region of Odisha province of India. Dola Holi Celebration lasts for five-seven days, unlike two days, in the rest of India. Dola celebration starts on Falgun Dashmi (date as per Hindu calendar) when all people take out Yatra (religious gathering) of their deities (especially Lord Krishna) and offering them Bhog (sweets) and Abira (colored powder). This yatra continues for the next four days and ends on Falgun Purnima (date as per Hindu calendar) by playing Holi. Isn’t that a good idea to participate in Dola and celebrate Holi for five days in a row? Phagunwa is the celebration of Holi in local dialect Bhojpuri of Bihar province of India. Phagunwa Holi is celebrated with the folk songs, Thandai and Gunjiyas and never-ending fun with family and friends. Why don’t you plan to Holi Celebration 2019 is Desi style of Phagunwa? Basant Utsav is the celebration of Holi in the West Bengal region of India. People welcome Basant Ritu (spring season) with open arms in West Bengal. They dress in yellow during Basant Utsav and play Holi with Gulaal (colored powder) for the whole day. Also, the Dola is a significant part of the Holi celebration in Bengal. 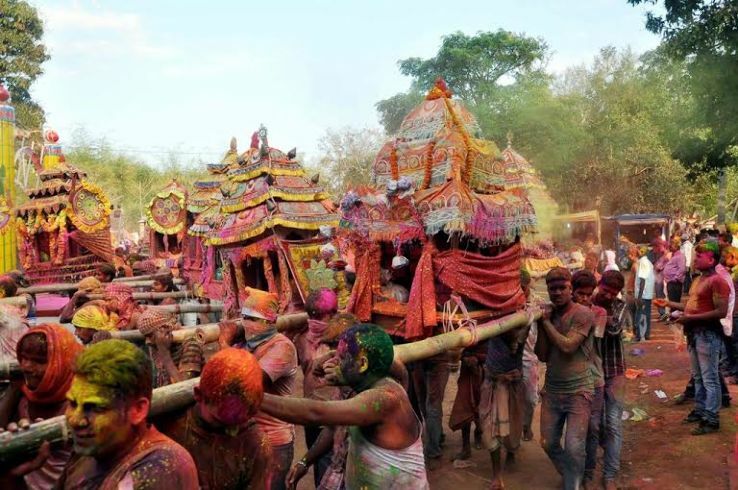 Dola Yatra (religious gathering) is taken out on the main day where people play colors with squirt and Abira (colored powder) along with the procession. It is a sight full of bliss, enjoyment, and happiness. Book the tickets for India to celebrate Basant Utsav, Holi in 2019. Shigmo Holi is a form of Holi celebration in the Indian state of Goa. It is one of the major festivals of farmers as they welcome spring delightfully. Shigmo Utsava is celebrated for 14 days with splendor every year. Shigmo is one of the traditional festivals of Goa, which is very different from other local carnivals of Goa. 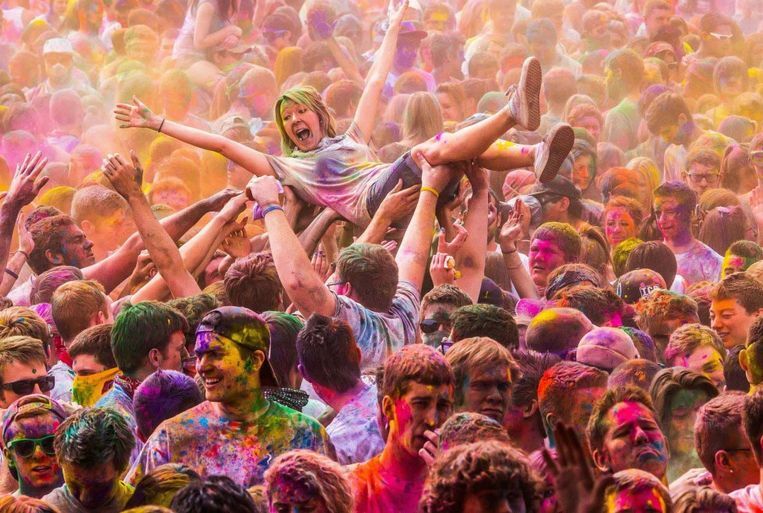 Just imagine the fun of Holi on the coasts of Goa. It’s an experience, worth giving a shot! 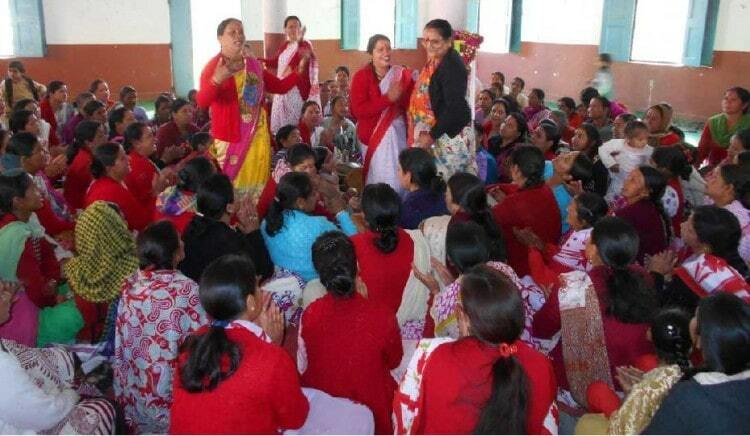 Yoasang is the Holi festival celebrated on the last full moon day of Lamda in Manipur province of India. This lasts for six days. The entire valley covered in festive colors during those days. The youth takes part in this by constructing bamboo huts on the roadside called ‘Yaosang’. An idol of Lord Chaitanya is placed in the hut by a Brahmin (Devotee). Puja is offered and bhajans and kirtans are chanted. On last day, the idols are removed and the hut is set on fire with the chanting of ‘Hari Bola’ and ‘He Hari’. The Holi is played in the Govindjee temple, colors are mixed in the wells and then sprayed on the people who dance in the beats of the devotional songs in praise of Lord Krishna. 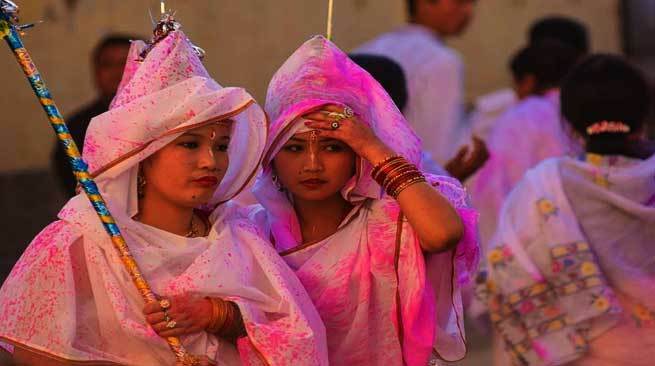 In Uttrakhand, Holi is celebrated as Baithaki or Khadi Holi, people gather in their traditional attire, singing traditional songs and roam around in the city in Toils. People wish each other by smearing colors on their faces. Holi is a festival of colors and frolic in Uttrakhand. In Maharashtra, Holi is also known as Rang Panchmi. The celebration starts by lighting a pyre of firewood known as Holika Dahan. The next day, people play with dry and wet colors twirling on the beats of music. The land of Roshagulla, West Bengal also has a very sweet way of celebrating the phenomenal festival of Holi. Holi is here known as Basant Utsava or Dol Jatra. 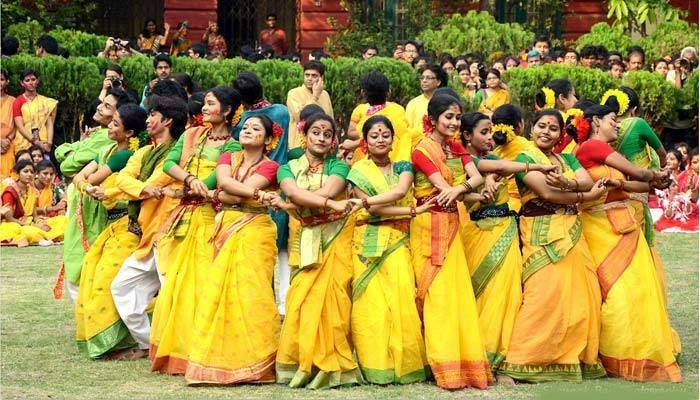 Women here dress in yellow, a color that signifies abundance and celebrates the rich Bengali culture with colors and music. In addition, there is also a recital of the poetry of Rabindranath Tagore with traditional songs and dance. 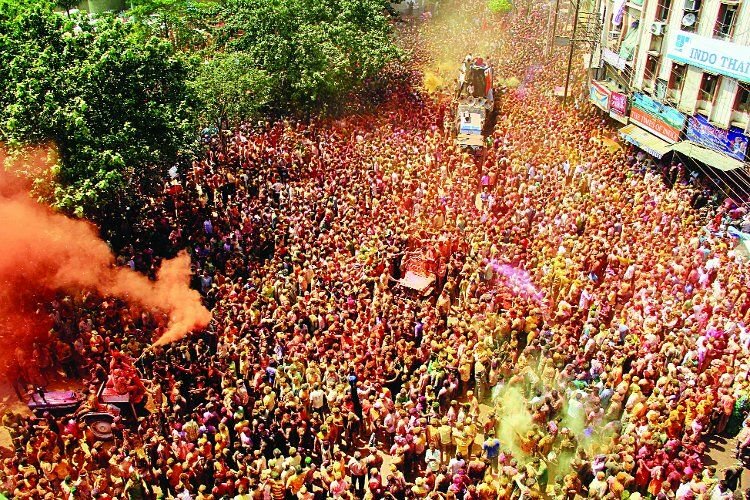 The day after Holi is celebrated as Dol Jatra, a humongous procession of Lord Krishna taken through the streets accompanied by singing and dancing revelers. In Kerala, Holi is celebrated as Manjal Kuli, also known as Ukuli. The Kumba and Konkani communities of Kerala have their own unique way of celebrating Holi. Turmeric or Manjal Kuli is mainly used as colors to play Holi. Pakuwah is the native celebration of Holi in Assam. It is quite similar to the Dol Jatra and you will find many common elements in the celebration alike West Bengal. Pakuwah is celebrated for two days. The first day, people burn the clay hut to celebrate the victory of good followed by the second day’s celebration with colors. 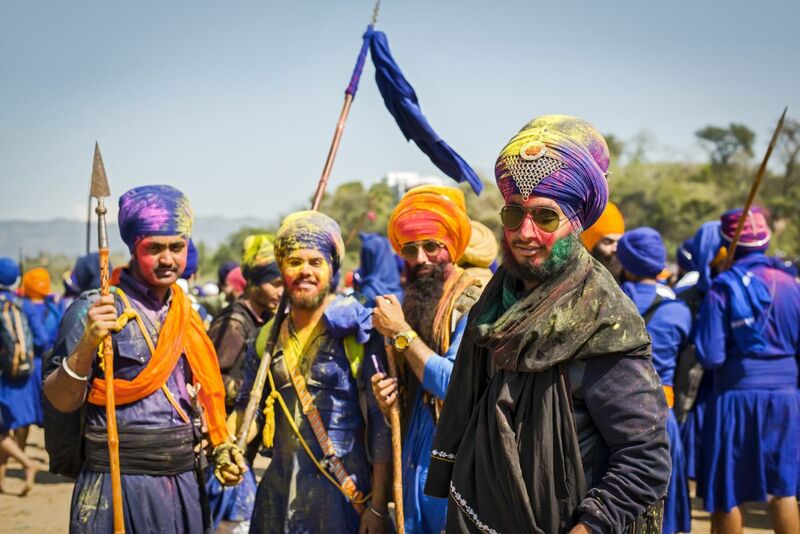 Famously known as the Holi of the warrior is celebrated by the Nihang Sikhs in Punjab. This is very unique and out of the box celebration of Holi. A day before Holi people exhibit martial arts, sing and dance their heart out. One festival and so many styles to celebrate, isn’t it beautiful? Holi is full of fun and happiness, lots of tasty cuisines and Thandai with colors all over the places where Holi is celebrated. Celebrating different types of Holi in 2019 among the natives is a superb idea for a never before experience. Tell us about your idea or participating In the Holi Festival in India 2019. Leave a comment below to know more from experts. We are here to assist you anytime.